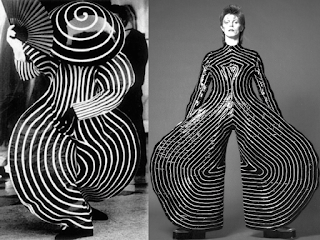 Our thanks to the brilliant Messy Nessy for her extended and studied appreciation of the sublimely strange Triadic Ballet of the Bauhaus Theatre movement of the 1920s. We had marvelled at the production and revivals beforehand but we were not clued into the backstory, inspiration and legacy enough to be able to enjoy it to the full extent, one always being induced to learning more, like realising the aspirations of Bauhaus itself was in a way realised in the lifestyle engine that is IKEA. The passage through the acts to something darker and more mechanised, formal and constrained in its expression, symbolised synthesizing the Dionysian impulse (which we’d assign to dance) in purely artificial and abstract Apollonian terms—which is ultimately the fate or anything staged and the burden of performance art. 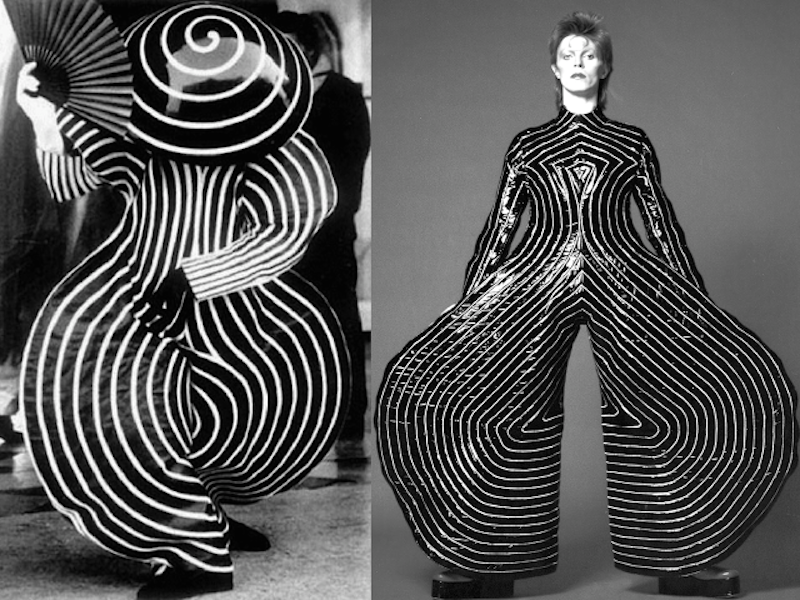 In fact, one of the character designs of Oskar Schlemmer that appeared in the third triad became the inspiration for Kansai Yamamoto’s 1973 Ziggy Stardust exaggerated jodhpur jumpsuit. There is currently an exhibit on set layout, choreography and costumes in Metz, and while no troupe is performing the piece right now, you can watch a video of a seminal production at the source link above.